Level Cap Increase & More! To celebrate the defeat of the Black Mage, we're increasing the max level cap to Lv. 275! Now you can make your character stronger than ever. If you can reach Lv. 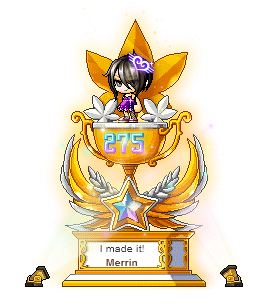 275, as a reward you'll receive the Symbol of Brilliant Honor Chair! New quests will be added to Tenebris daily. You can play the daily quests by clearning the story quests in each region of Tenebris. You can play 1 quest in each region for a total of up to 3 daily quests each day. Complete the Moonbridge story quest to find Gloom in the Eye of the Void. A party of 1-6 can fight Gloom. Entry count limited to once daily. Clear count limited to once per week. Complete the Labyrinth of Suffering story quest and clear the Labyrinth of Suffering Deep Core Dungeon to find Verus Hilla. A party of 1-6 can fight Verus Hilla. Complete the Limina story quest to find Darknell in the Final Horizon. A party of 1-6 can fight Guard Captain Darknell. Complete the Limina story quest to find the Black Mage in the Giant's Heart. Spark of Determination: Acquire by completing Tenebris daily quests and by defeating Gloom or Darknell. Shadow of Annihilation: Acquire by eliminating Verus Hilla. A part of 1-6 can fight the Black Mage. Characters Lv. 225 and above that have made the 5th job advancement can track down the remnants of the Black Mage's power to unlock new Genesis Weapons! Once you complete the Limina story quest, you'll receive the Genesis weapon quest through the notifier on the left side of the screen. Accept the quest receive a Sealed Genesis Weapon Box from the quest to obtain a weapon based on your class! You can complete various missions afterwards to unleash the true power of your sealed Genesis weapon. These missions involve defeating each of the Black Mage's Commanders with special restrictions in place. Upon defeating each Commander (excluding Von Leon), you'll also need to defeat the Black Mage's Afterimage 8 times so you can claim a trace item. Upon completing all missions, Zero will acquire a Genesis Essence that can enhance Lapis/Lazuli to a Type 10. Use all available upgrade count with 15% Spell Trace enhancements suitable to each job. Additional Star Force and scroll enhancements are not available. Zero can choose whether to transfer Potential and Bonus Potential. Aeonian Rise: Use the power of creation to become invincible for 12 sec. When the skill ends, activates the Genesis Force which attacks 12 enemies with 1,500% damage 7 times. Use the skill again to end immediately. Cooldown: 180 sec. Tanadian Ruin: When the attack hits, the Power of Destruction activates and increases Final Damage by 15% for 30 sec. Cooldown: 90 sec. Coming soon in a future update, prepare to return to Grandis to learn more about Magnus and his master, Gerand Darmoor. There's plenty more to be revealed, so stay tuned and get ready for a new, epic chapter of MapleStory to unfold! Celebrate the defeat of the Black Mage with these Alliance Victory Appreciation events!